If this card is Fusion Summoned: You can have this card lose 1000 ATK this turn, also it can attack directly this turn. 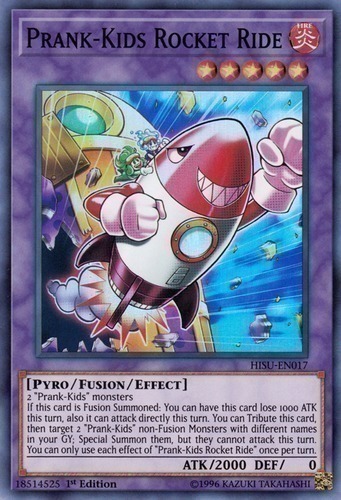 You can Tribute this card, then target 2 "Prank-Kids" non-Fusion Monsters with different names in your GY; Special Summon them, but they cannot attack this turn. You can only use each effect of "Prank-Kids Rocket Ride" once per turn.